Acting President, Yemi Osinbajo on Tuesday met with traditional rulers from the North over the quit notice to Igbos by some youths in the North. Recall that the meeting, initially scheduled to hold Monday, was postponed. 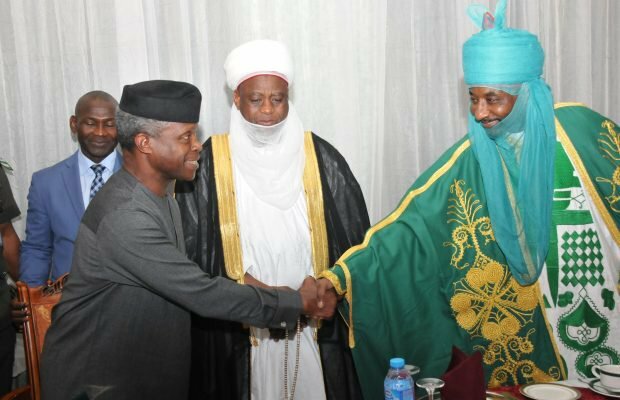 At the parley, Osinbajo affirmed the readiness of the Federal Government to protect the territorial integrity of the country. He observed that traditional rulers play critical roles in the affairs of the nation. Osinbajo said: “On our part as government, we will ensure that the entire apparatus of government is deployed to ensure that no one threatens Nigeria’s territorial integrity, that no one threatens the lives or livelihoods of any Nigerian living anywhere in the Federation. I welcome you, our royal fathers, elders and leaders, to this important meeting. I thank you for taking the time to respond to our invitation to dialogue and engage with us. Your demonstration of commitment and leadership is heartwarming, and I have no doubt that we will all be enriched by our interaction today. This meeting is the third in a series that commenced last week. I have met with Leaders of Thought from the North, and Leaders of Thought from the Southeast, and on Sunday with Traditional Rulers from the South-East. Yesterday you graciously consented to joining us at the Iftar, ahead of today’s meeting. As Royal Fathers and Traditional Leaders, your place and your role in our society and nation is significant. You are the custodians of our cultures and traditions, and living embodiments of our rich heritage. You are, by virtue of your vast knowledge, wisdom and experience, both a vital link with our past, and an important guarantee for the success of our future. This is why your role in national affairs is critical. The reason for these series of meetings is well known to all of us: it became necessary in the wake of a spate of divisive statements, in recent months and weeks, pitting the South-East against the North. We are all aware of the so-called ‘ultimatum’ issued by a group of Northern youths, asking that all Igbos living in the North vacate the region. Before then, there was the clamour – and it’s still ongoing – by some South-Eastern youths, operating as IPOB and affiliated groups, demanding secession from Nigeria. In all our previous engagements with Northern and South-Eastern leaders, we all came to the consensus that Nigeria is stronger and better together, and that these hate-filled and divisive rhetoric and agitations are unjustifiable, unacceptable and often times illegal. And I would like to reiterate that today. Nigeria has seen enough violence and bloodshed in its history, the price of our unity has already been paid in the blood and lives of hundreds of thousands of soldiers and civilians. President Muhammadu Buhari spoke of his commitment to one Nigeria as arising from his experience in the Military, where he fought side by side with Nigerians of every tribe and faith. He said “we protected each other, put our lives on the line for each other, we were brothers even in the face of death.” This is the type of nation we must maintain. As Royal Fathers and Leaders, I think you will agree with me that we all have a role to play in countering the voices of divisiveness, and the elements who seek to take us down a bloody path. Let us continue to counsel the misguided elements among our youth, who think that ethnic confrontation is a game and that words can be thrown around carelessly without repercussion. Having said this, let me say that we are not deaf to the legitimate concerns and frustrations arising from around the country. Every part of Nigeria has its own grievances. But these have to be expressed graciously and managed with mutuality rather than with scorn and disdain. I would like to assure you all that we are here to listen and to answer, and, very importantly, to reassure everyone that we are committed to the unity of Nigeria, and that upon the foundation of that unity we can together build a prosperous and great country. We must never take our diversity for granted; the fullness of our strength actually lies in that diversity. And we must wield that diversity, not as divisive tool, but instead as a binding agent. As we round up these consultations tomorrow with a meeting with governors, it is clear to me that we are all resolved to, by words, conduct and action, promote the unity of our dear nation. On our part as government, let me say that we will ensure that the entire apparatus of government is deployed to ensure that no one threatens Nigeria’s territorial integrity, that no one threatens the lives or livelihoods of any Nigerian living anywhere in the Federation. Our objective is to provide the environment for a prosperous nation, a nation where all regardless of ethnicity or religion can pursue their legitimate aspirations peacefully and securely. Once again I thank you for your time, and your unyielding cooperation and support. May the Almighty God continue to give you the wisdom and the strength to preside over your Kingdoms and the good health to reign long and reign well.